Every couple I've done a photoshoot for has been special but these two are extra special. Here's why. They are the first ones (after my husband) to know that I was pregnant! I couldn't bring myself to cancel on them the next morning after finding out the good pregnancy news. I was in a lot of pain. Google says that early stages of pregnancy can be painful. My husband begged me to cancel the photoshoot but I just couldn't. I couldn't let Ace down. From our email correspondence, she was super excited about her honeymoon in Paris, more so for her Paris photo session with me to capture their special occasion! And we couldn't reschedule because that was the last day of their stay in Paris. I could spot them being my clients as Ace paced around excitedly on the Trocadero platform looking out for me. I smiled. She approached me and I gently explained my situation. Their photoshoot of one hour stretched to two hours with me performing the session sitting down for most part. They were so helpful, patient, understanding, sweet and grateful all at the same time. And the glorious morning light!! It went on to be bright and cloudy later but when we started the photo session, the low rising sun was pushing out beautiful rays of pink hues through some heavy clouds. The effect was just dreamy and magical! A beautiful morning in Paris! They loved their honeymoon photos with raving reviews. I am glad that I've managed to make them happy people despite that pain in the belly that day. Needless to say, this was my last photoshoot of 2015 up until December 2016! 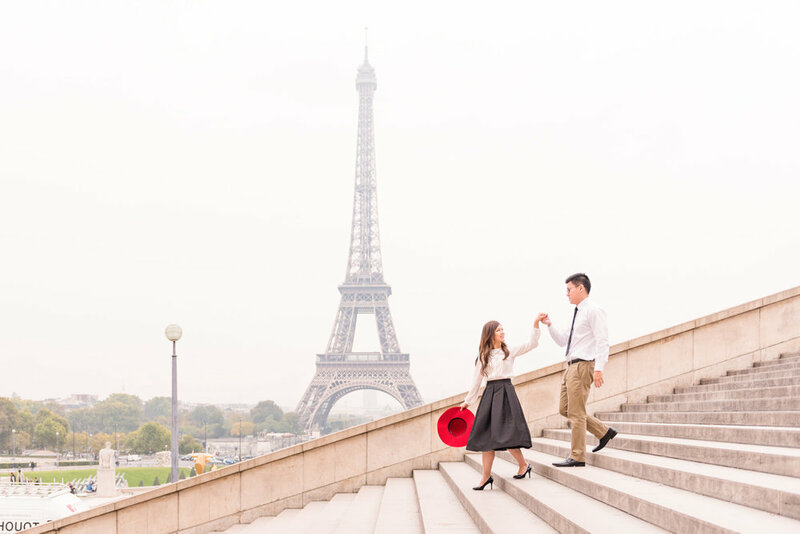 If you would like a similar photoshoot for your honeymoon in Paris, all you need to do is click on the button below and you would be sure to have fabulous memories too!